From malicious hackers to accidental voice recordings, data processed through virtual assistants may open you to security and privacy risks. Have you ever worked with Siri, Alexa, or Cortana? These all started as consumer-facing virtual personal assistants (VPA), used in most smartphones and for products like a voice-activated television remote. But as of late, VPAs are evolving into Intelligent Virtual Assistants (IVA) for business applications. some communications vendors are now using IVAs to support business functions like arranging meetings and conference calls. Did you know that with such digital assistants your voice data is sent to the cloud or another remote location for processing? Is it safe to talk in front of your TV remote? Are you putting your business data at risk of being compromised by asking Alexa to start your meeting? An IVA is a system using artificial intelligence (AI) that emulates human interaction to accomplish a task or tasks. IVAs are expanding because of neural networks, machine learning, and other advancements in AI technologies. The intelligence technology allows IVAs to learn, reason, and understand, performing tasks such as behaving like a customer service agent to solve customer problems. In contact centers, in fact, IVAs are used for a variety of applications in several vertical markets. They help consumers accomplish tasks by providing an intuitive interface for connected homes and vehicles (see "Everything You Need to Know About AI Assistants, From Siri to Ozlo"). The IVA ecosystem is comprised of three major parts. In a remote cloud location, a call processing center analyzes and responds to the text and/or voice commands and performs the requested action. At the user end, there is an end device such as an Amazon Echo or a PC with Cortana. These devices have embedded applications installed that communicates with the IVA. The user's request is submitted to the IVA in text or voice, or possibly in a chat format, and is stored in the cloud. IVA conversations are accessible through the companion app and user's device. This produces one of the privacy risks, because the voice recordings can potentially provide personal identification information or unauthorized entities could use that data to identify the user. IVA software can be integrated into IoT devices. Many IVAs allow third-party vendors to link their devices and services, expanding the features and skills of the IVA. As an example, the Alexa Skills Store contains more than 10,000 voice activated apps. I am sure that there will be creative hackers who will develop malware that will provide opportunities for privacy and security attacks of IVAs. There have been incidents recently that highlight the significant security and privacy risks associated with IVAs. Since IVAs are still maturing, expect more of these risks to surface and more imaginative attacks to occur over time. A NIST article, "Alexa Can I Trust You?" points out four possible security/privacy vulnerability scenarios, as shown in the below diagram. 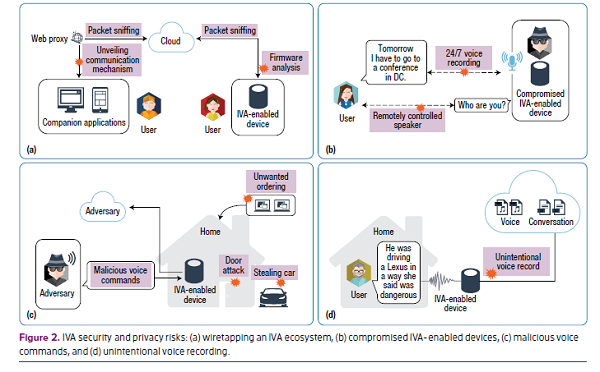 Graphic from NIST paper, "Alexa, Can I Trust You?" Packet sniffing is part of network diagnostic systems. Packet sniffing can be applied to capture the communications to and from an IVA. Requests and responses can be analyzed to determine which APIs are in use. As the article pointed out, not all network traffic is transmitted over secure connections. Some use unencrypted connections to check network conductivity, making it possible to detect the IVA devices. Even though IVA communications may be encrypted, there are machine learning techniques that can classify the traffic and report on payload sizes, data rates, and other patterns. Encrypted traffic can be used to identify the status of the device. I have published blogs about IoT security in the past -- "Striving for Secure IoT" and "Peeling Away the Layers of IoT Interoperability." It's important to note that IVA devices can be compromised just like any other endpoint. You can even experience a denial-of-service attack. Webcams and DVRs can be infected with malware. The end device can be commanded to be always on and listening, such has been done with many Internet-connected baby monitors. How about your collaboration systems? Are they at risk? Since IVAs work off of voice commands, an attacker could impersonate the user and issue malicious voice commands. It could open up a smart door, start a car, or even order items online without the user's knowledge. Some IVAs provide a voice training feature to prevent such impersonation. It is always possible that if the impersonation is good, the IVA may not be able to distinguish between the real and fake person. A person speaking within the range of the IVA device can be recorded. This may be accidental, but the person's comments would still be transmitted to the cloud, which allows other parties -- including those with legitimate access to the stored data as well as hackers -- to break into the database. They can eavesdrop on the private conversations. The potential for unintended recording means that you do not necessarily have complete control over your voice data. I've heard this is a possibility with smart TVs with voice commands. Could our collaboration networks be compromised? We have learned that as we introduce new devices into IP networks, they typically do not have security as their primary design goal. The Internet was never designed to be a truly secure network environment, so security is left to the endpoints. Security is usually an add-on later, after a number of incidents occur that highlight the security problems. It appears that those who build endpoints and produce software need to elevate security in their designs and development.